Last school year 2012 – 2013, the Department of Education rolled out the implementation of the new K to 12 Curriculum in the Philippines. It is now the new basic education curriculum for our country. Based on general knowledge, as to what the general public has understood, the K to 12 program is for the betterment of our children’s future and for some, it is an additional two years of financial obligation for parents. 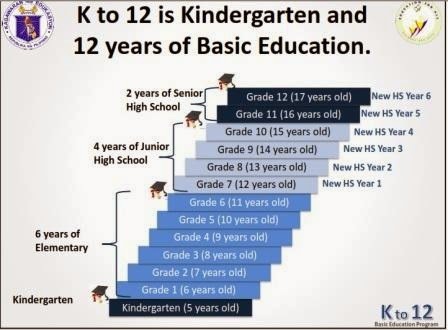 So, what is K to 12 Curriculum? What does it really mean to us, the Filipino people, and our children? Personally, am I in favor of this new basic education program? The K to 12 Curriculum is the latest basic education program from the Department of Education (DepEd). It is a hybrid of the previous curriculum which emphasizes on making the Filipino graduate ready for employment and/or higher education. The graduate is envisioned to be equipped with the 21st Century Skills such as (a) learning and innovation skills, (b) information, media and technology skills, (c) effective communication skills and (d) life and career skills. They aimed to accomplish this by having a mandatory kindergarten and an additional two years to acquire set of skills that will help them get employment after education or adjust to their chosen field of specialization in college. Most parents reacted negatively about the K to 12 program of the Department of Education. The additional two years for high school was perceived as another year of financial obligations. They took it as a burden rather than something beneficial. They believed that the government should focus more on providing additional number of textbooks with at least 1 book is to 1 pupil/student ratio, more conducive classrooms, more schools and a lot of efficient teachers rather than having two more years for the students. Then after several information drives about the K to 12 curriculum and how it will benefit the public, more and more parents are reacting favorably to the new basic education program. Some parents who could not afford college are now confident that their children will be already employable after he graduates. Knowing that their children will acquire world-class quality skills makes it appealing especially to the masses. It sparks hope that their children can land a job after all his schooling. As for me, I was negative at first too. Being a solo parent to three children, all of them are already under this program (my eldest being the first batch of Grade 7); I was totally unfavorable towards this. Sending three children to school is no joke. Financially, even for now, is already taxing. But then again, I realized that the K to 12 curriculum is indeed very beneficial for the Filipino people. Since most parents could not send their children to college, the hope of employment and acquiring skills shed a light of hope to parents. They will be confident that their children will become self-sufficient and may take jobs for a living or for college expense. My children and I might encounter several financial struggles along the way but in the end, long term wise, my children will end up as graduates equipped with the 21st century skills and will become at par with other nations. Aside from that, I believe that through the K to 12 program of DepEd, they will be now guided properly to which course they should be getting in college. I don’t want them to end up like me taking a course just because and ended up regretting about it a few years later after graduation. I believe that this program will bring new dimensions to the country’s future work force, a new hope of world-class citizens and therefore, a new hope for the Philippines!